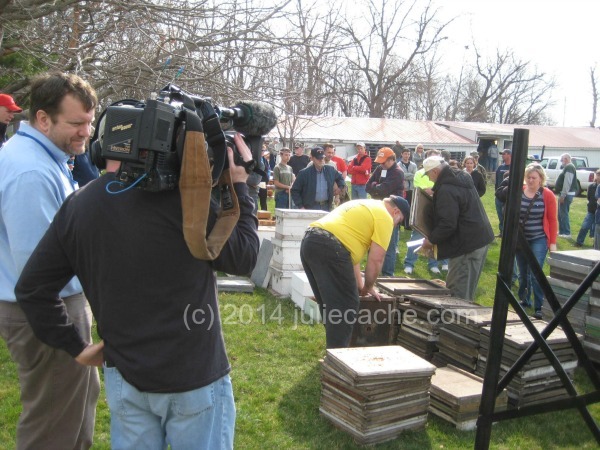 I attended this year’s bee auction based on last year’s crazy calls for swarm relocation. Some people think free bees are great, but they are a gamble. You just don’t know if they will be productive enough to outweigh the work it takes to get them or if they’ll be hostile enough all year that you wish you didn’t have them. Before I had extra equipment, a swarm would have required a good amount of resource juggling at most times of the year. 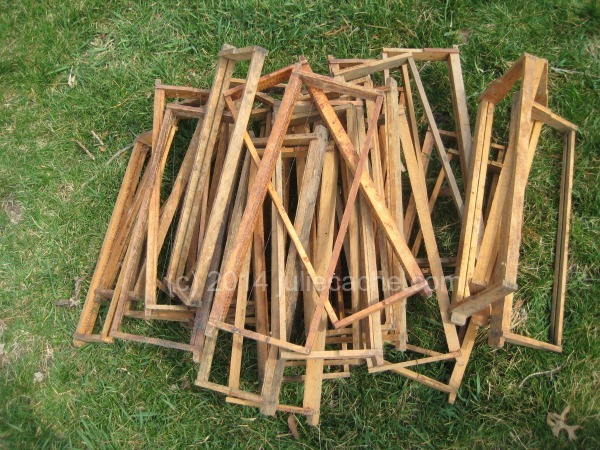 If I know I have a good colony, I don’t mind using new woodenware, but with a risky swarm, I prefer to use bargain auction stuff. Auctions are fun because you never know what you’ll find. I read the consignors’ list, but until I can see condition, it’s hard to know what will be for sale, and some things never make the list. There are always random things, like these frames. I didn’t get any, but for some reason, I always end up getting things that I didn’t think I wanted, no matter how much I plan. I was very pleased to get a spacing comb (mine is sort of like this one). It didn’t make my shopping list, but I had thought about buying one in the past. For $5, I’m game for almost anything! It was interesting to see IPTV there, taping for Market to Market. 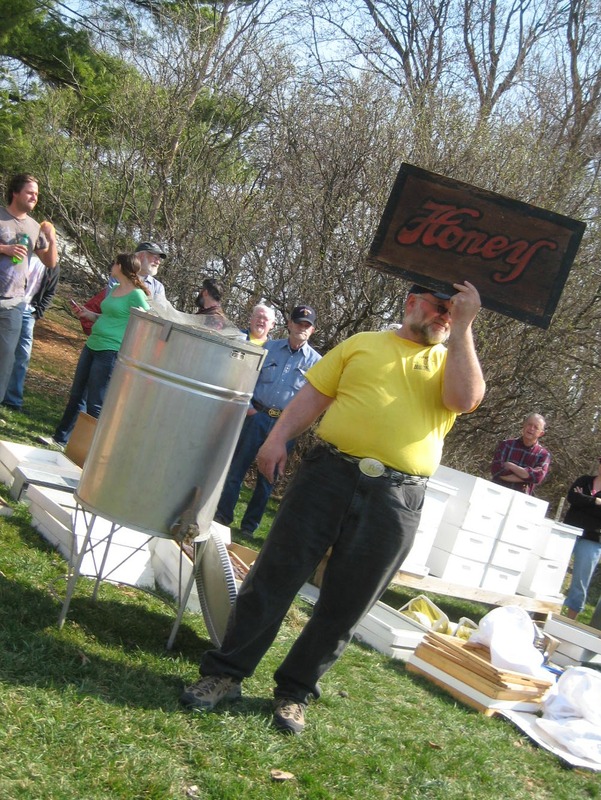 Beekeepers came from over an hour away to attend the auction. To me, that means the auction is unique, well-timed, and a good thing for the keeper community. Market to Market, I am happy that I can watch you online. 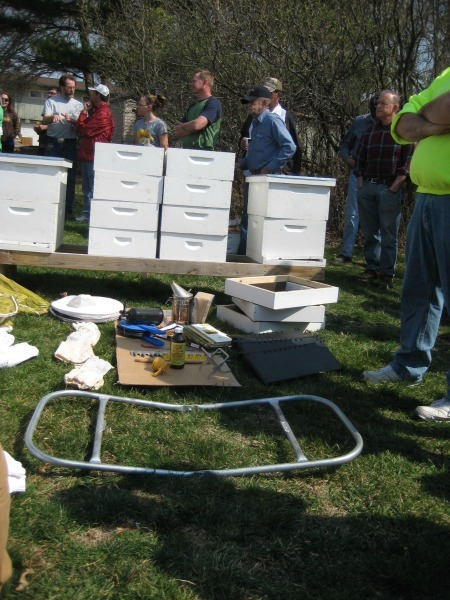 This was the first time I ever saw a used hive for sale — by used, I mean boxes full of drawn comb with honey. 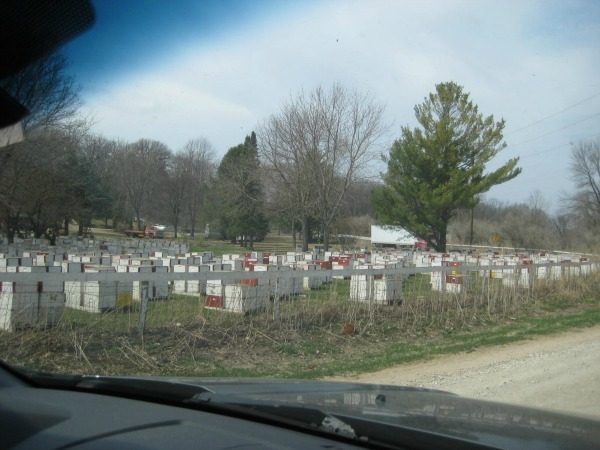 In fact there were two such hives. There was also a decorative sign in this lot; that was a first for me. The first lot was also noteworthy — an archive of a honey businessman’s transactions from 1940’s. Look how white and clean everything is! I also thought it was pretty crazy to have warm, dry weather. I purposely dressed in layers — wicking tank, thermal top, and jean jacket with useful pockets — and wore a performance fabric ballcap. I seem to remember a light drizzle and 40 degrees last year, which I confirmed with the excellent Weather Underground archive. 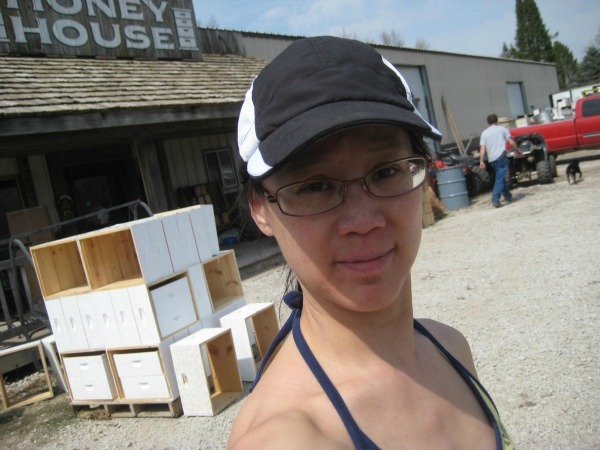 I rode with a new beekeeper to the auction, and we stopped at nearby apiary and supply shop afterward. Have you ever seen anything like this? Fifty degrees makes a nice day. Unless you have dead bees.